– HKKMS/KMRC are going to have a non-conference without so much time devoted to the dreaded talking head. Let’s hope David Gurteen pulls this off. – David Gurteen & Mark Pixley are running a one-day “KM Unworkshop: Making KM Projects Work. – Bonnie Cheuk from Citi will talk on social media barriers, knowledge sharing and Web 2.0. There are very few KM people with as much real world business experience in how to make KM work as Bonnie. – A big conference exhibiting and probably too many talking heads – Online Asia – is a chance for many working in the area to gather, see and share knowledge on how, where and what to find. – Hong Kong Records Managers are having a long waited gathering sponsored by Recall Hong Kong Ltd.
“The Professional Services Development Assistance Scheme (PSDAS) is established by a Government allocation of HK$100 million to provide financial support for projects which aim at increasing the competitiveness of Hong Kong’s professional service sector as a whole, or of individual sectors, in external markets including the Mainland market. In addition, projects aim at enhancing the standard of professional services in Hong Kong are also eligible.” They accept applications from management consultancy groups and individuals. The deadline is 31 March 2011. I went to the Re-ignite conference this past weekend in Hong Kong. This is part of the Hong Kong’s 2nd Asia Consciousness Festival. Gino Yu from HKPolyU’s Design school has been the driving force behind the festival. The theme was ‘rediscover your life’ or ‘rediscover what is possible – personal and organizational transformation’. I arrived on Saturday afternoon around 2 and stayed until end of the day on Sunday. Upon arrival there was a yoga class with Lawrence Milman, who has developed ‘freedom yoga’. More like yoga with a smile and we still did the Om. This was followed by a workshop run by Gino about non-verbal communication; we looked into our partner’s eyes for five minutes. Different types memory recall and memory construction (telling un-truths) can be mapped to eye-movement. At the end of Saturday there was a session of staged talking heads on social entrepreneurship. These were good and thank-fully they only had 18 minutes so there was none of the fatal ‘conference lecture syndrome’. Joy Tang from Taiwan is working on bringing sustainable development to Ghana with the One Village Foundation. This is real knowledge transfer in action between Ghana and Taiwan. Todd Darling from Hong Kong talked about founding and running a organic food distribution company, Home Grown Foods, and involved in a successful sustainable restaurant in HK’s Soho, Posto Pubblico. The rise of sustainability and environmentalism is quite amazing over the past 10 years here in south-east China. John Fitzpatrick talked about starting a furniture design business based on modular bamboo shelving. Todd and John’s stories made me reflect that so many local Chinese HK people have stopped trying to start anything new. I hear so often that it’s impossible to start a business in Hong Kong. I wonder why this has happened? Scot Frank talked about solar cookers for rural communities in the Himalayans. I would have liked to heard more about the the distribution system. Sunday morning was more talking heads but interesting ones. Jeffrey Martin explained how you need to match your emotional development to the sort of therapy you were going to try. This is quite sensible and helps to explain why one technique works well for some people but fails and even harms others. Stefania Lucchetti talked about time management. Can we ever get beyond email? Stefania has a useful perspective as a working attorney and a new mother. There was a long coffee break for useful chatting and strawberry cream puffs. Joachim de Posada “the marshmallow man” talked about delaying gratification as a good indicator for future success. Ivy Ning came up and described herself as “in the climate change business”, hmm, I guess it is a business these days. She talked about Spiral Dynamics of Clare Graves ~ a bit towards the L. Ron Hubbard end of the spectrum. A beautiful coloured spiral showing personal evolution. Ivy is about to have a baby so had that wonderful mother-to-be glow. Three experiential sessions (I had to look this word up) ~ it means learning thru physical activity. The yoga and interactions sessions the day before had also been experiential sessions. I’m learning here. The first was run by Judith Hovetter on Feldenkrais Method stretching. I’ve done some stretching classes before so I now good it can make me feel. Judith made us very slowly make one very long whole body twist and at the end of 30 minutes we all felt completely relaxed. Steven Ng explained and made us do some qi-gong and tai-chi exercises that were effective. If you live in Hong Kong and want to know more about chi and how to hold it then I recommend contacting Steven. The end of the day were sessions by Rafael Bellavita, Gen Kelsang Tonglam and Gary Hart. I couldn’t really follow what Rafael was talking about ~ the link between investing and spiritual transformation. Where was the link? He made better investment decisions because he meditated. Gen Kelsang Tonglam was inspiring. Undoubtedly being a rock-star handsome Buddhist monk has its advantages (and possibly a few disadvantages). He explained about being ‘of the world’ with the World Peace Cafe in Wan Chai was better than being cloistered. Gary Hart is a scientist who has attained that level of nothingness, living with no thoughts talking constantly to him all the time, which is the goal of so many meditation techniques. 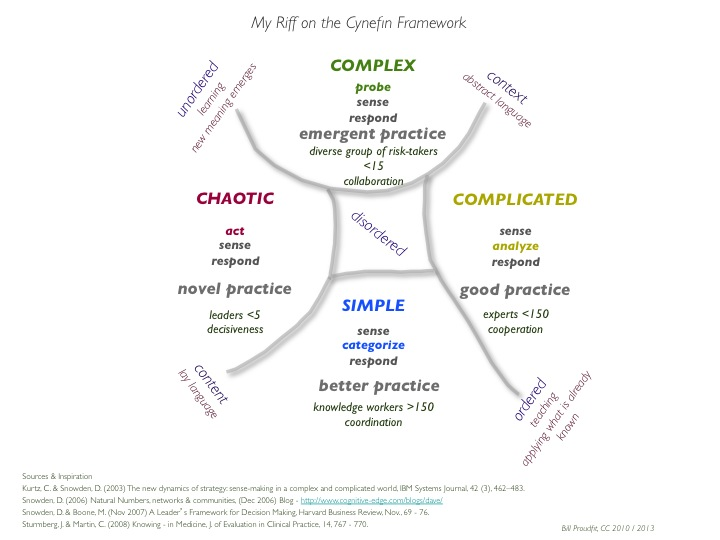 I’ve been working on this interpretation of the Cynefin (kun-ev’in) sense-making and decision-making framework for months. This combines 4 sources; Cynthia Kurtz and Dave Snowden (2003), Dave Snowden and Mary Boone (2007), Dave Snowden blogging (2006) and Joachim Sturmberg and Carmel Martin (2008). See here for some of the Snowden references. I started this after I took the Cognitive Edge practitioners course in Sept. 2009. I’ve kept a copy of the framework taped into the cover of my notebook and I have kept adding and deleting to it. At the ICKM 2009 conference I heard Louisa Lam from the HK Chinese University library talk about her research on sense-making from interviews with doctors and nurses in Hong Kong public and private hospitals. She kindly gave me her presentation and the reference to Sturmberg & Martin’s excellent paper. This is also related to my earlier post on Patrick Lambe’s ‘Knowledge Wheel’ here. The framework quite accurately describes how sense-making and decision-making takes place in large and small organizations. This is based on my experiences at a very large international corporation, one of the world’s largest construction projects, a large urban private university and restaurant and catering kitchens in France and New York city. I used various versions of the framework in a couple of different papers and projects during my MSc Knowledge Management. My riff deliberately has a lot of words; it is not meant to be simple and elegant. The sources all have much more elegant diagrams of the framework. Here I want to have a mnemonic of the facets that interact in the framework. A lot of times the framework is drawn without the centre ‘disorder’ and I feel it needs this centre to make the point clear that the actors are always trying to compress and minimize the force of ‘disorder’. Snowden and Boone use ‘order’ ‘disorder’ and ‘unorder’ in their paper and I think it helps to show all of them. In this version of the framework ‘ordered’ ‘disordered’ and ‘unordered’ form one continuum thru the centre and ‘content’ ‘disordered’ and ‘context’ form another continuum. These intersect at ‘disordered’. ‘Content’ and ‘context’ are borrowed from Sturmberg and Martin. For me ‘content’ means solid, verifiable fact or the gut-feeling that this is the right thing to do. Leaders in a chaotic situation need ‘content’ to push thru a decision. Knowledge workers need ‘content’ to make sense of normal and expected events. For me ‘context’ is that body of related and potentially useful knowledge that experts and risk-takers rely on to make their decisions. Experts and risk-takers need the ‘context’ of a situation to know when to analyze or to probe. ‘Ordered’ situations are suitable for teaching and applying what is already known. ‘Simple’ and ‘Complicated’ better practice and good practice responses can be taught quite successfully. ‘Unordered’ situations are flexible learning environments that require a more collaborative and ultimately decisive response. ‘Complex’ and ‘Chaotic’ responses need time to emerge and form. ‘Simple’ and ‘Complicated’ responses can be applied successfully in large groups. The groups may even benefit from being hierarchical with defined and predictable relationships among the actors. ‘Complex’ responses need a small and very socially flat group to work out when and how to probe, sense and respond. ‘Chaotic’ responses need a very small egalitarian group or only one leader to make the critical and insightful decision to calm down or solve the situation. I did a search of the SCMP, South China Morning Post, and found out that I had 6 letters to the editor published in 2009. They are on a variety of topics from where I live, Discovery Bay, Drug Testing in schools, Teacher-Student ratios in primary and secondary schools, Recognizing local artists, Disneyland and the HK Government. I reproduce them here for my New Year’s post. Discovery Bay residents simply love to complain. They complain about the ParknShop prices even though it is obvious the prices are the same here as at other ParknShops. The current Fusion offers a wide variety of European, North American, Latin American, Japanese, Korean and other goods that are not readily available at most ParknShops in the city. Few customers seem to realise how much trouble is taken to provide them with what they like. They complain about sky-high bus fares. Can you imagine having to pay HK$4 for a bus ride? It is just too shocking. The hire-car is HK$15, so let’s complain. The buses are too noisy. Let’s complain. The swimming pool closes too early. Let’s complain. They complain they can’t have a car. They complain there are too many or too few or it is not convenient, or something. I like Discovery Bay. It is well-managed, convenient, clean and quiet and has many trees, and flowers and pleasant walks are abundant. People who live in Discovery Bay simply love to complain though. Have you heard the new hotel, that it is wasteful, will never have any customers and the few it will have are likely to be bad characters? And, let’s complain. The school drug testing programme is absurd. The time, effort and resources should be put into drug education and counselling. Chasing after students to invade their privacy only teaches them that they have no civil rights. Students who refuse these tests are less likely to be drug-users but are more likely to be students who understand something about freedom. Some casual drug use is going to happen among students. They need to know the risks and have help available to them. Drug testing is only teaching students the risk is being caught. The chief executive started this absurd campaign and it is time he stopped it. It is yet another example of his disdain for human rights in Hong Kong. Drug testing has been tried in other parts of the world and it does not have a significant impact on reducing drug abuse. I wonder if Eugene K. K. Chan, vice-chairman of the Association of Hong Kong Professionals (‘We must act to curb youth drug problem in HK’, August 14) would be in favour of the scheme if it were being piloted in the top-tier Anglo-Chinese schools? Does Angela Chong, of Macau, want to live in a society where she can be searched on suspicion of any crime (‘Nothing wrong with testing’, August 14)? In both cases, I think the answer would be ‘no’. If it is happening to ‘someone else’, it will be okay. Drug testing of students is likely to result in a student testing positive because of doctor-prescribed medication. They will probably learn how to circumvent the tests. Drug abuse education should be a priority. Students will be pressured into this ‘voluntary’ testing scheme by teachers, school administrators, parents and fellow students. Testing will not reduce drug abuse but it will lessen students’ respect for authority and confirm there is little respect for human rights in Hong Kong. This is a poor lesson to teach our young people. I refer to the article by Anthony Cheung Bing-leung (‘Smartest export’, May 12). He asks if Hong Kong has ‘a knowledge-rich environment, and a free-thinking, inquisitive and creative ambience that should form the basis of a vibrant education hub’. As is normal in education plans and policy in Hong Kong his emphasis is on tertiary education. Hong Kong will never achieve [such an environment] unless it reduces the primary-level class sizes to 20 and the secondary-level class sizes to 25 and increases the number of native English-speaking teachers in every primary and secondary school by a factor of five. How can the King of Kowloon’s calligraphy be saved? A Home Affairs Bureau spokesman has declined to comment on the artistic value of ‘King of Kowloon‘ Tsang Tsou-choi’s street calligraphy, even though his work was exhibited at the Venice Biennale and adopted by designers as an iconic image of Hong Kong. The Hong Kong government has no vision and no ability to recognise talent or acknowledge what Hong Kong people value and respect as creative expression. They are willing to spend millions on an art complex and contract out art education to schools with credentials that have been questioned. There really is no hope for art in Hong Kong. I refer to the report (”HK will not bow to Disney pressure’,’ March 23). Secretary for Commerce and Economic Development Rita Lau Ng Wai-lan said negotiations with Disney on the designs for its expansion had not reached the final stages. She said the government needed to know what the new attractions would be and whether they ‘would fit the market’s appetite’. This is the essence of the problem. The Hong Kong government is not staffed by amusement park operators. The administration has got involved in the day-to-day running of a theme park and this will not work. The government’s interest in Hong Kong Disneyland should be a passive investment. Officials should have nothing to do with vetting attractions like Disneyland and trying to gauge the market. They will never do this well. We only need to remember the West Kowloon arts complex fiasco.